**From 2011 on the 90th anniversary of the Anglo-Irish Treaty signing. Please see link below to access the full document. 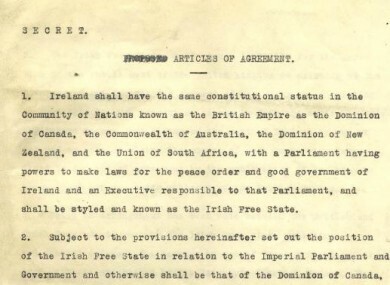 ITS YELLOWING PAPER is still marked ‘Secret’ but the Anglo-Irish Treaty signed between an Irish contingent and the British government on this day 90 years ago is now available to view – in full – by the public. The signing of the Treaty by a delegation including Michael Collins and Arthur Griffith and British Prime Minister David Lloyd George’s delegation led in part to the Civil War in Ireland but was also a step on the road to full independence for the Republic of Ireland. On the day in which Ireland labours under a new Budget of austerity and a loss of financial sovereignty, the National Archives of Ireland has published in full and for the first time online, the full 1921 Treaty document. While it set up the “Irish Free State”, it also asked members of the Irish parliament to swear to be “faithful to H.M. King George V”. And most controversially of all, it outlined in articles 11, 12 and 14 how Northern Ireland would remain geographically and politically separate from the South. See the whole document here on the >>National Archives website. This page was loaded Apr 25th 2019, 9:50 pm GMT.